The 543 Mono Compressor delivers the unobtrusive, musical-sounding dynamic control and brick-wall limiting made famous in the Portico 5043 to the 500 series format. The 543 features a fully controllable compressor-limiter with feed-forward / feedback modes, Peak / RMS detection and a built in side chain high pass filter. With an unrivaled heritage and a tremendous feature set, the 543 yields a combination of rich warmth, flexibility and precision that is sure to resonate in the ears of sound engineers the world over. The 543 also has the ability to switch between feed-forward and feed-back modes. If the V.C.A. Control voltage is taken from the 543 output, (i.e. after the V.C.A.) it cannot act immediately on the V.C.A. because it has already been modified by settings of the V.C.A. and circuits through which it has passed. This is known as a “Feed-Back” compressor. The two compression characteristics are quite different; there is more “Overshoot” and both the attack and recovery ramps are changed, providing the user with powerful choices. One of the more unique features of the 543 is the new Peak / RMS mode also found in the Portico II Channel. This switch allows the VCA (voltage control amplifier) to respond to both RMS (Root Mean Square) and peak levels. RMS circuits are considered to better mimic the way the ears perceive apparent loudness, while peak circuits tend to directly respond to the waveform voltage which may be more of a concern for prevention of clipping and maximizing levels. In this case, peak mode uses a combination of both methods to get the best of both worlds, and avoids the drawbacks of each method on its own. Setting the right values of RELEASE and ATTACK is what compression is all about! 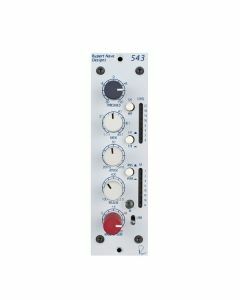 Once the principles are understood a Compressor-Limiter such as the 543 provides a powerful tool that actually appears to enhance the dynamic range of a recording and so provide greater musical enjoyment. The notes above explain how the 543 handles signals of constant amplitude such as pure tones. Real program signals, however, are continually changing in level. The way in which a compressor deals with actual program material depends upon the magnitude and duration of peaks in the program level. If the RELEASE TIME is set to be very short, a short duration signal will be compressed but the gain will return to normal very quickly, giving a fluctuating and un-natural sound known as “Pumping” when the background, or other signals, are forced up and down. The gain will also tend to follow the wave form of low frequency signals. RELEASE TIME should be set long enough for the gain to remain reasonably constant between each bass note or between speech syllables. When engaged, the 543 uses a combination of peak and RMS (average) detection to determine level. When disengaged, it follows just RMS. When the LINK switch is engaged on two 543 modules and settings are approximately the same values, GAIN reduction on both channels will be the same to preserve stereo balance and position. This will work properly in link buss enabled 500 series racks, or by hardwiring two 543 modules link busses together in non-compatible racks. When the LINK switch is engaged on two connected 543 modules, the signal passing through the first module may be used to control the amplitude of a second module. For example, the level of music through channel A can be controlled by speech on channel B, i.e. reducing the music level to make a "speech-over" announcement. Maximum Output Level: Balanced and Floating Transformer Output Maximum output from 20 Hz to 40 kHz is +23 dBu. Noise: Measured at Main Output, un-weighted, 22Hz-22kHz, Terminated 40 Ohms. With Gain at Unity, Compressor disengaged Better than 103 dBu. Frequency Response: Main Output, Unity Gain @ 18 Hz, +/- .1dB @ 150 kHz -3 dB. Crosstalk: Measured Channel to Channel: Better than 90 dB @ 15kHz.